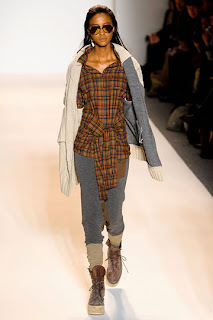 The first full day of Mercedes-Benz Fashion Week Fall 2011 kicked off with Nicholas K, one of my favorite designers. Nicholas K is known for leather jackets, plaid shirts, sweaters and scarves, with the addition of velvet this fall. It's a cohesive collection with strong separates that are easy to layer. These wearable pieces are definitely ones that you can carry over from season to season, while creating an edgy, modern look. "I was inspired by the woods and rustic living; the survival instinct and going back to primitive ways. The fall colors of the forest are reflected in the palette and overall aesthetic and I used a lot of texture and incorporated Navajo inspired prints. Think log homes, gypsies, stone fireplaces, owls, camping and migration," explains Nicholas. Nicholas K collaborated with Vintage Shoe Co. to create limited edition boots, including a unique and edgy"Creeper" style for both men and women. Below are some of the images I took during the show.